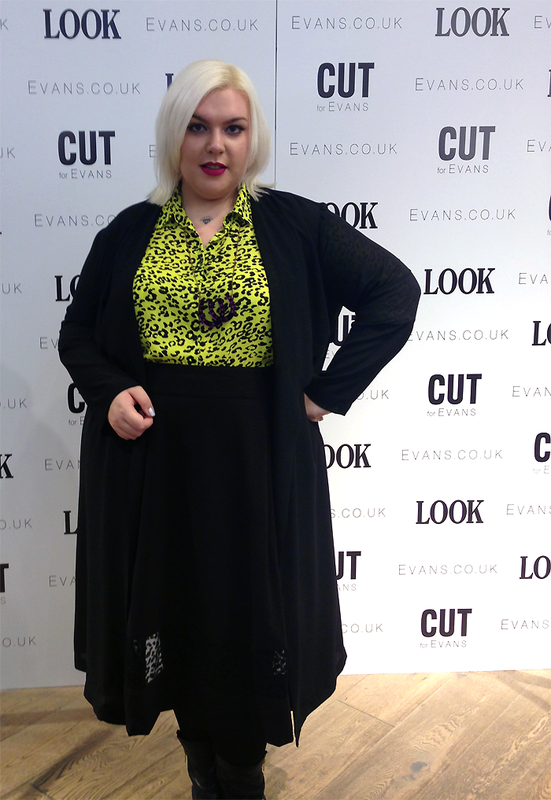 Cut for Evans AW14 Launch Party - Sugar, Darling? On the cards today is a little write up about an adventure I went on last Wednesday. 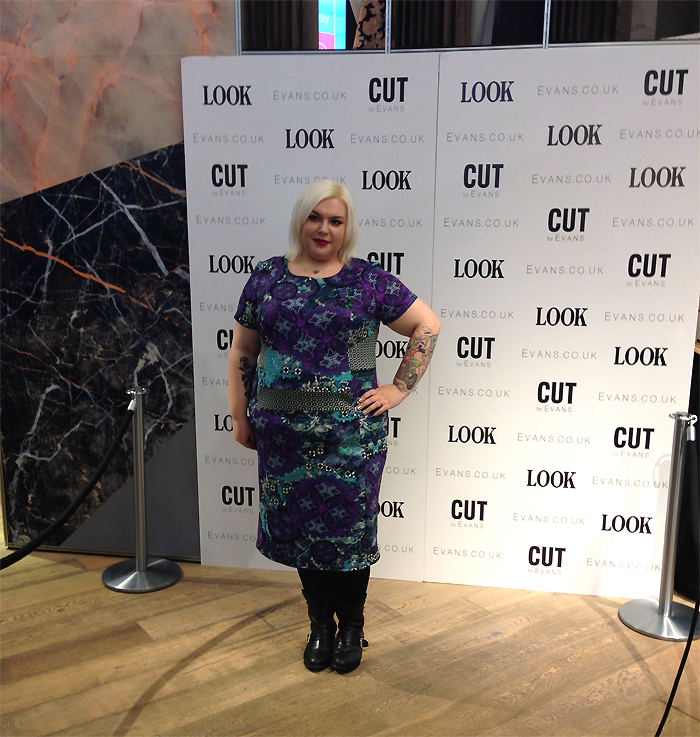 I was very excited to be invited along to the latest AW14 Cut for Evans launch party at their flagship store on Oxford Street and when the date came it wasn't a disappointment! 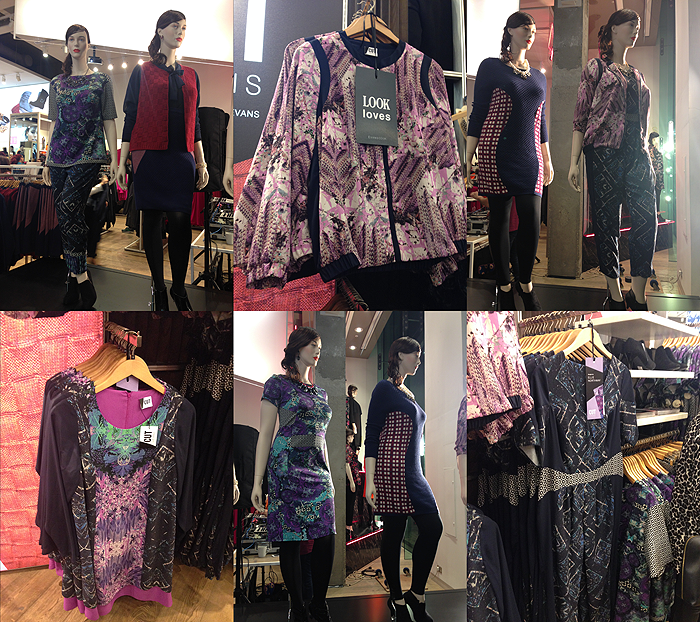 I really loved the last Cut for Evans collection but unfortunately had missed out on the blouse which was the standout piece for me last time so I was delighted to be able to try on the new collections right after they'd been launched. This year's two winners were Eve Turley from Kingston University and Ellie Northway from Nottingham Trent University (which is only half an hour away from me!) and both were wonderful. As I'm a big fan of bright colours and bold patterns I was naturally drawn to Ellie's pieces which featured a wonderful palette of pink, purples and blues and my love was tipped over the edge when I read that her prints were inspired by famous women throughout history - I'm a history nerd and a fashion nerd and so this was the perfect match for me! We all know I'm a dress fiend and so the first thing I grabbed was the dress up above. The colours and kaleidoscopic prints was just dreamy and I loved how the black and white patches and panels contrasted against the bold purples and blues. It was a lovely fit and made from comfortable thick stretchy scuba fabric. My only small gripe was that I would have liked the panel over the waist to be a little higher and possible as I love a 3/4 sleeve for them to be longer, but other than that it was dreamy. 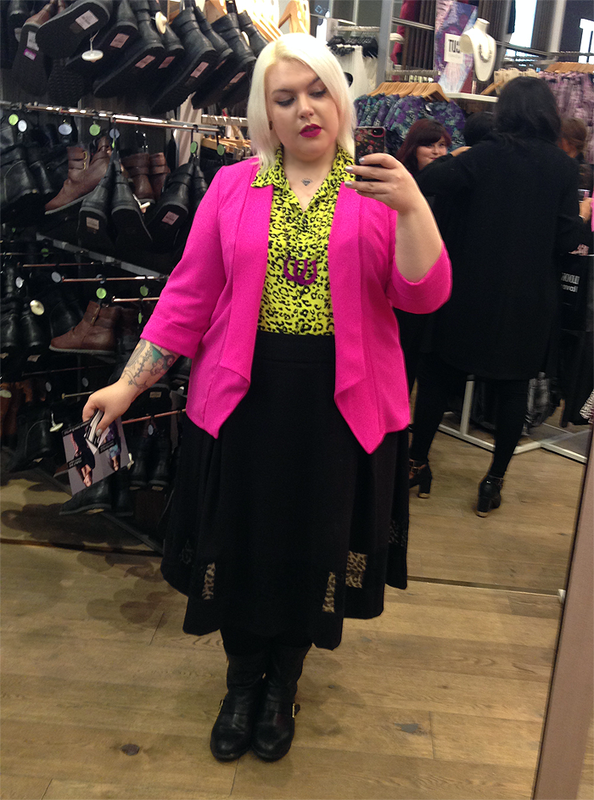 Sadly the shift dress I tried which was also from Ellie's collection just didn't suit my figure (I was expecting this as I can't often pull of shifts) and the bomber jacket I was hoping to try was gone in my size by the time I went to try it. I didn't try any of Eve's pieces myself but Leah looked fantastic in the navy and red skirt and cardigan and George looked amazing in the navy and red check dress. You can see all the pieces currently available here. Of course while I was in store I had to try a few other pieces that caught my eye, one of them being this beautiful longline semi-sheer cover up jacket from That Day. That Day are a new brand available at Evans and their pieces are just dreamy - keep your eye out as I'll be featuring a few of their dresses very soon! One thing I'm absolutely kicking myself about is that I didn't buy this jacket while I was in store. I figured it would be a pain to carry around with me and thought I'd get it online later, but when I went to order later that night it was sold out in my size! I'm SO sad about this as I loved it to bits - if anyone spots this in a size 22 please please please let me know, I'll happily Paypal over money for it and pay for you to post it to me - I need it in my life!!! 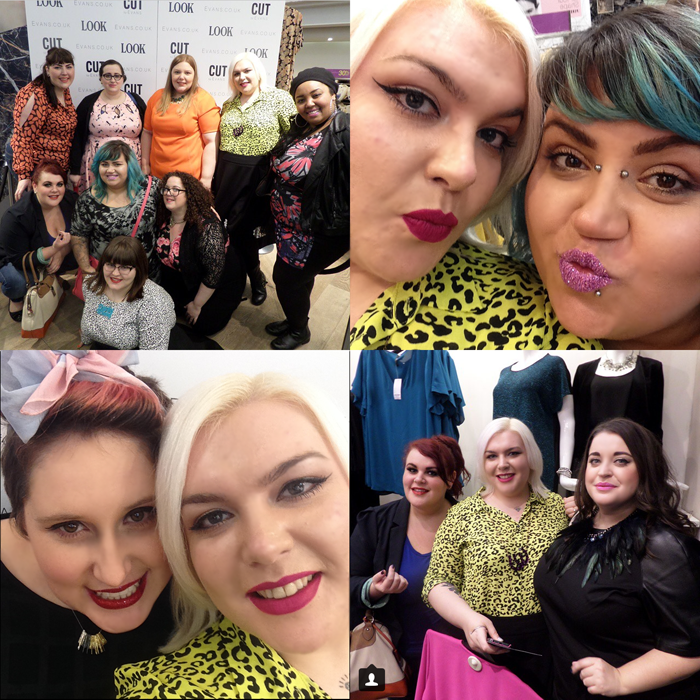 Of course my other favourite part of the event was getting to hang out with lots of my gorgeous blogger babe pals! As none of them live near me it's so much fun seeing everyone and catching up at these events, I love it to bits! 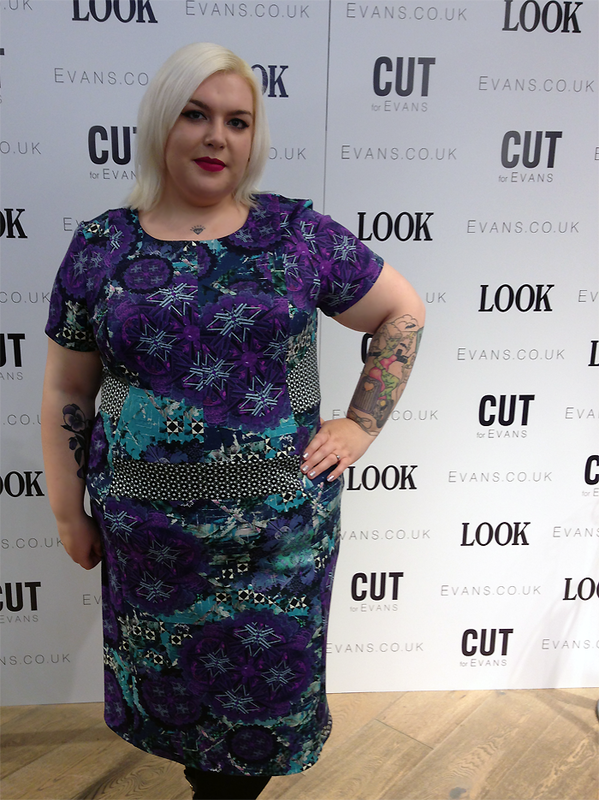 Have you checked out the new Cut for Evans collection yet? What do you think?